Benjamin Lignel, editor di Art Jewelry Forum, piattaforma di informazione e dibattito culturale intorno al gioiello artistico contemporaneo (art jewelry) ci ha aiutato ad approfondire il tema del rapporto tra gioiello ed editoria indipendente, durante l’incontro, Pubblicare il gioiello contemporaneo, tenuto a Milano al Laboratorio Formentini per l’editoria, in occasione della mostra di settembre 2016, Gioielli n Fermento, ornamenti passione e convivialità. Nel 1997 negli Stati Uniti, alcuni collezionisti di gioielleria con una visione estetica affine hanno formato Art Jewelry Forum (AJF – il forum della gioielleria artistica). Concepirono AJF come un ente capace di informare i partecipanti tramite delle attività partecipative sia americani che internazionali. AJF ha funzionato inoltre come un punto di riferimento e d’incontro per le persone direttamente coinvolte: curatori, storici, gli artisti stessi, (ed ancora altri) e molti altri. A volte piccoli gruppi di collezionisti hanno viaggiato insieme per saperne di più e per comprare pezzi, ed AJF informava i membri dei viaggi collettivi quattro volte l’anno. Presto però, ci si è resi conto che AJF avrebbe potuto fare di più ed informare una comunità ben più grande. Nel 2000 AJF ha stabilito il suo primo sito web e nel 2010 ha nominato Damian Skinner (neozelandese e storico delle maestrie artistiche) il suo primo redattore. Con queste due mosse AJF si è definito come un forum globale per diffondere la conoscenza, la comprensione e l’apprezzamento del gioiello artistico contemporaneo. Adesso, AJF (di cui io sono l’editor al momento) pubblica online circa quattordici articoli, interviste o recensioni al mese. La gioielleria contemporanea occupa luoghi e si espande grazie a risorse non proprie: fotografia, graphic design, presentazioni in power-point, la parola scritta e detta. E questi luoghi non “naturali” introducono una discrepanza notevole fra lo scopo dagli artisti orafi (cioè: realizzare degli oggetti che si definiscono proprio nell’interagire fra loro e le persone che li portano) e la realtà degli oggetti stessi. Hanno una loro esistenza proprio in virtù del fatto che sono pubblicati. Art Jewelry Forum (AJF), launched in 1997 by a group of like-minded jewelry collectors in the United States, was primarily conceived as an organization to educate its constituents through direct immersion in local and foreign jewelry centers. It also functioned as a self-aware incubator for the field’s cultural stakeholders: curators, historians, and the institutions for which they work. Collectors traveled in small groups to learn about and buy work, and quarterly reports on foreign expeditions were sent to members. The organization soon saw the importance of expanding its mandate, however, and wanted to make the information it gathered available to a wider audience. In 2000 AJF launched its first website, and in 2010 it appointed New Zealand craft historian Damian Skinner as its first editor, thereby recasting itself as a global platform with a mission to “help [its] readership . 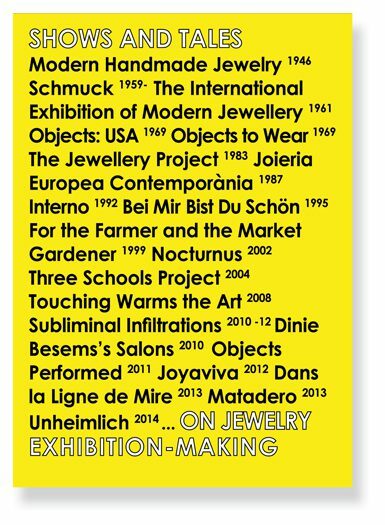 . . build knowledge, understanding, and a critical appreciation of contemporary art jewelry.” AJF (for which I now serve as editor) currently publishes online an average of fourteen articles, interviews, or reviews per month. The different formats we use – review, interview, long essays, and shorter analyses, best-offs, media sightings, videos – aim to provide readers with the instruments and information to understand and make sense of a fast moving field. My work, as editor, consist in shaping the editorial vision of the platform, commissioning pieces from contributors, putting those texts through the editorial process, and uploading them on the website. Alongside this editorial activity, I organize round tables, publish one book a year for AJF, write essays for other publications, conduct writing workshops, curate exhibitions: all of this partake in the “ceaseless production of discourse on contemporary jewelry”, to which I am just one of a growing pool of commentators. Blogging is the way in which we get to complicate the world again. Ben Lignel. An art historian (B.A., New York University) and furniture designer (M.A., Royal College of Art) by training, Benjamin began designing jewelry as soon as her earned his master in 1995. In 2007, he co-founded La Garantie, Association Pour Le Bijou, an association with a mission to study and promote jewelry, which has spearheaded numerous interdisciplinary projects in France and abroad: In this capacity, he co-curated Also known as jewellery, a exhibition of French contemporary jewelry that traveled six countries; he helped program and organize the 44th Zimmerhof symposium (2012) in Germany (focusing on the public and the private), as well as Bijou(x). Les Pratiques contemporaine à l’épreuve de leur discours (2014) a two-day symposium hosted by the Paris College of Art. Lignel started contributing essays and op-eds to magazines and publications in 2006, and became a member of Think Tank, A European Initiative for the Applied Arts in 2009. From then on, his professional endeavors shifted towards more curatorial, editorial and educational projects: in 2013, he became a guest teacher at the Akademie der Bildenden Künste (Nuremberg, Germany); he also organized Différence et Répétition, a research-by-exhibition project that was shown in Norway and France. Lignel was appointed editor of Art Jewelry Forum in january of the same year. His position requires him to commission reviews, interviews and essay on contemporary from an international roster of academics and emerging writers, whilst overseeing other AJF projects (this included organising round-table discussions between most of the world’s contemporary jewelry content providers in Munich, in 2014 and 2015). Lignel lectures extensively on various aspects of the jewelry field, and has contributed writing to several museum publications. He is currently working, with co-editor Namita Wiggers, on his fourth book, which will be dedicate to jewelry and gender.